With us ringing in the new year a few weeks ago, manufacturers are off to the races in bringing us the new and improved versions of their heavy-duty trucks. Between Chevrolet, Ram, and Ford, we have a ton of new features and statistics coming our way as Ford has recently brought out their newest edition of the Super Duty. According to social media, when this truck goes on sale this fall, this truck will be the king of the road. Under the hood of the new F-Series trucks, enthusiasts like yourselves will have multiple engine options including the 6.2-liter V8 gasoline engine, the new 7.3-liter V8 gasoline engine, and the third generation 6.7-liter Power Stroke turbo diesel V8. Facts that have been released on the new 6.7-liter engine is a new upgraded turbocharger, new engine internals, and a 36,000-psi fueling system. These engines pair with the new 10-speed automatic transmission. With this new driveline, Ford guarantees improved efficiency from this new design. Furthermore, along with the expected tow/haul option, the 10-speed transmission adds extra driving modes including slippery, deep sand and snow, and eco mode. Like the F-150, the engineers’ at Ford have crossed some of that technology over the heavier trucks. New aids include Pro Trailer Backup Assist, Pre-collision braking with pedestrian detection, blind-spot monitoring with trailer coverage, lane keep alert, and automatic high-beams. Pro Trailer Backup Assist allows drivers to steer a trailer while reversing by simply twisting the knob on the dash. The truck learns the direction in which you’re wanting the trailer pointed, and turns assists in steering the wheel. This feature is also compatible with gooseneck and fifth-wheel trailers. In addition to assisting with heavy trailer loads, these new trucks will offer electrohydraulic power steering that will offer a lighter effort at the wheel at lower speeds. In this day in age, electronics are a hot topic. What once was only a popular item as handhelds, it has evolved into the world of automobiles. Inside the cockpit, the Super Duty comes equipped with a 4G LTE Wi-Fi hotspot that can connect up to ten devices at a time. Other electronic aids are USB Type C charging ports and wireless phone charging. As expected, the 2020 Super Duty received a new look on the inside and out, but maybe not as much as some would’ve expected. Varying by trim level, there are some differences available. New wheel design, restyled bumpers, new tailgate design and improved grille design that has changed to improve airflow into the engine bay. On the interior, there are many new materials used in different trim levels. If you’re a fan of luxury, the Limited model Super Duty comes with two-tone ebony and highland tan treatment along with leather, ash w, od and aluminum trim. Ford certainly has rung everyone’s bell thus far, and we can’t wait to get the full spec list on its entire build. Stay tuned as we get more details on this truck in the near future! 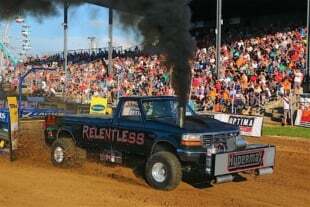 Artie Maupin is from Southeast Missouri and has an extreme passion for anything diesel. He loves drag racing of all kinds, as well as sled pulling competitions.